With the LG G Watch officially introduced at Google I/O, AT&T immediately came forward to announce that it will be one of the first U.S. carriers to offer the wearable. The timepiece, as announced earlier, will be priced at $229 and is expected to ship on or around July 7th. It will be offered in two colors, White Gold and Black Titan. The watch syncs with any Android handset running 4.4.3 or higher, allowing you to receive notifications and other important information right on your wrist. 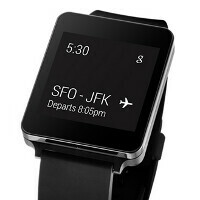 LG's timepiece was one of two that was introduced today at Google's developer conference. The other was the Samsung Gear Live. The circular faced Motorola Moto 360 was expected to see the light of day on Wednesday, but has been delayed until later this summer. Why? no one likes AT&T. We don't need your over price data caps. No one likes AT&T while they're number 2? "AT&T's "Winning" Streak: Rated Worst in Customer Satisfaction Three Years Running"
And still number 2. I'm not even an AT&T customer. Why would anyone in their right mind buy this from AT&T instead of the Google Play Store? What's the difference? The price is the same. Or am I missing something? You have to deal with customer service through AT&T, while if you buy it from the Play Store you have Google's awesome customer service. Maybe some carrier branding from AT&T. Why complicate it by buying it from AT&T if you can just buy it directly from the Google Play Store and not have to deal with AT&T at all? Yeah, you've made some good points! These are good points. On the plus side for ATT, the convenience of being able to try something out at the store is worth something.